Detecting vascular disease just got easier ....... much easier!!! Calling Physicians, Surgeons, Podiatrists, Vascular and Diabetic Nurses and Tissue Viability Nurses everywhere. Vascular Expert from BlueDop Medical has been developed by Vascular Scientists with decades of experience in the field. We are aware that some 20 to 30% of PAD referrals from physicians are Diabetics who are poorly diagnosed by current ABI technology. Every day in the Vascular Laboratory we are asked to assess the contribution of PAD to the patient symptoms where conventional ABI tests have failed. The solution is here, the solution is now. 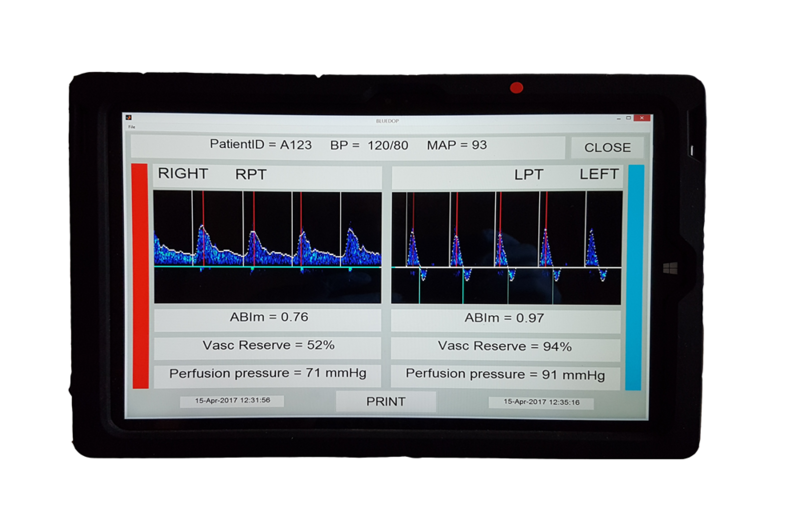 Using a patented "pressure from flow" algorithm, Doppler spectra obtained from any convenient pedal artery can generate accurate diagnostic ABI, and perfusion pressure data, unaffected by medial artery calcification, ulceration and calf swelling. Every component of the system is designed to make life easier for hard pressed health professionals. If you already use Doppler based ABI assessments you will have gained all the skills you require to get started. Training can be as simple as navigating to the "getting started" page on the website. The Doppler probe ("The Egg") communicates with the tablet computer (The "Brain") using Bluetooth technology so no annoying cables to get tangled up. The egg is hermetically sealed in a smooth biocompatible silicone rubber casing which can be washed under a tap and wiped clean with your preferred sterilising wipes so there is nowhere for bugs to hide. The tablet ("Brain") is housed in a rugged shock proof case and has battery power to run continuously through a complete clinic session. when repeatable blood flow waveforms are identified. It then shows on screen "Cuff free ABI" and a whole lot more! At the end of a clinic session just place the "Egg" onto the "Basecharger" unit. This will inductively charge its batteries. Plug the charger "umbilical" into the "Brain" and Vascular Expert will be "topped up" ready for use in the next session. and flow to the limb. Perfusion pressure in the foot is directly correlated with ABI, however because mean arm BP (MAP) can vary between individuals (70mmHg to 140mmHg) the same value of ABI could be associated with perfusion pressure of 30mmHg in one patient and 60mmHg in another. At 30mmHg there is a high probality of necrosis. At 60mmHg the tissue will probably remain viable despite the loss of autoregulation. Regard this useful little gadget as the fuel tank. It will go negative as the autoregulatory system reaches its limits and passes into CLI territory. Clinical Information in the Report page! ‘Cuff Free’ ABIm is vital. The threshold value for PAD is < 0.8. Expect sensitivity and specificity in the 90 – 95% range for even the most challenging cases, well above the documented diagnostic accuracy for conventional ABI testing. Perfusion pressure is also important, assisting the decision to compress or not to compress a swollen calf. Vascular Reserve signals loss of autoregulation when it drops into negative territory. The color bar is an innovative independent indicator of disease, switching from Blue to Red in the presence of significant arterial disease. Our patented ‘pressure from flow’ algorithm just needs an arm BP reference to estimate MAP and a Doppler signal from an ankle artery to estimate mean perfusion pressure at the ankle site. 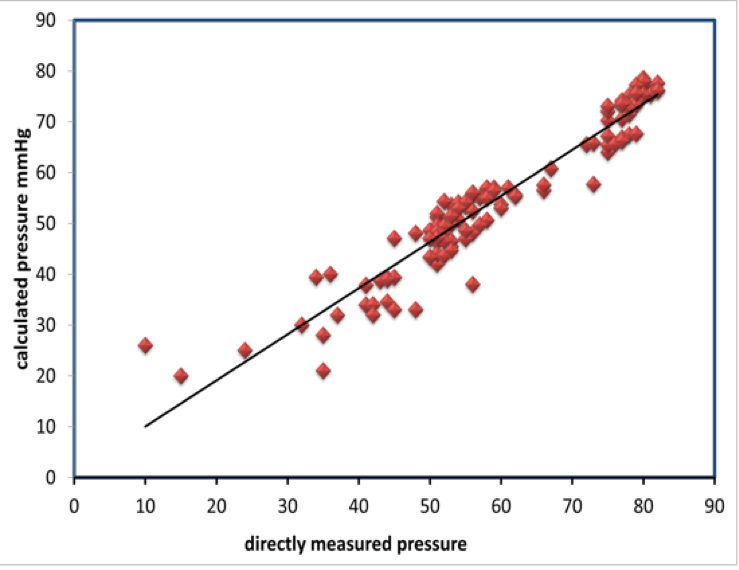 This graph shows the relationship between measured and estimated perfusion pressure compiled from in-vivo experiments. 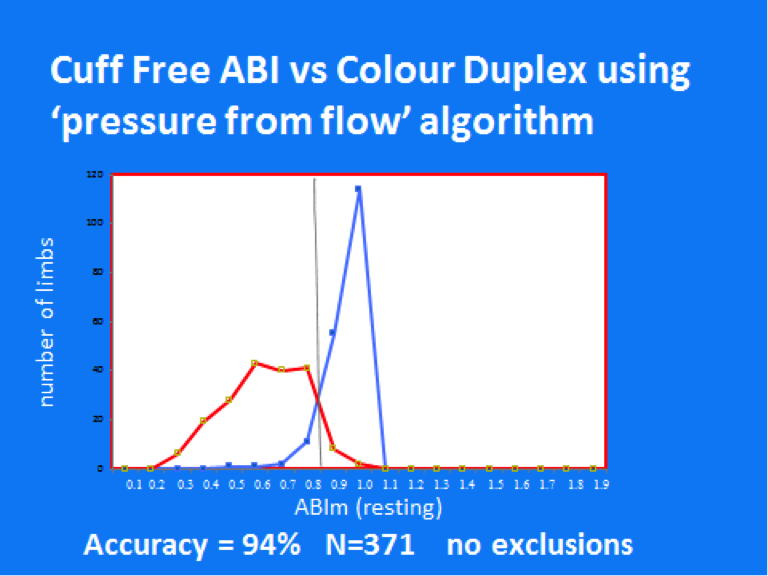 By dividing mean perfusion pressure by MAP we obtain ‘cuff free ABI’. When correlated with PAD identified on Duplex assessment, two distinct curves emerges. The distribution of PAD and normal limbs taken from a cohort of vascular patients shows a clear crossover, indicating a PAD diagnosis at ABIm < 0.8. 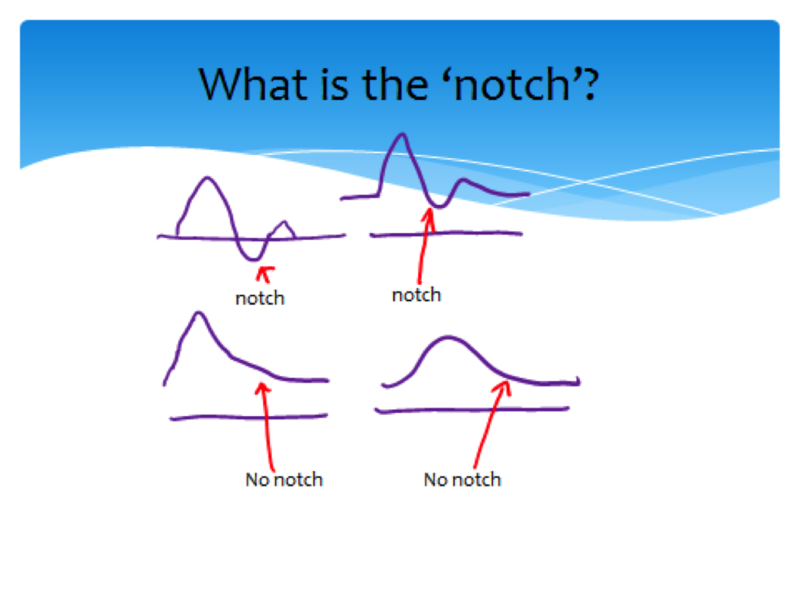 We don’t just rely on perfusion pressure and ABIm to diagnose PAD, we have ‘the notch’ algorithm to back up our results, even when an accurate arm BP is not obtainable. The diagnosis is shown as a simple colour bar, Blue=Normal. Vascular Expert detects subtle timing changes in the Doppler Spectrum that human experts just can’t do, so adding an extra confidence factor into our diagnosis.